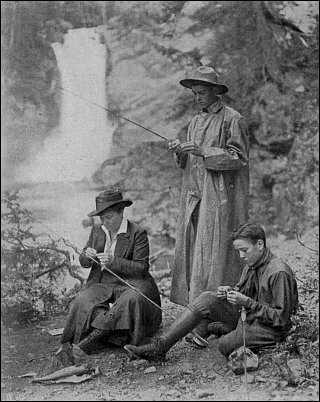 Klement's earliest memoir, 1919, unpublished, extensively annotated ©2008 In view of the fact that the commercial clubs of the county and others interested are just now getting busy on the problem of a state highway over the Cascade mountains by way of one or the other of the tributaries of the upper Skagit [River], it is felt that any information relative to the situation in those regions will be of interest. Indeed, were there but one possible pass through these mountains, the road, in all probability, would have been built thirty years ago, but there are three; namely, the Cascade River Pass, the Thunder Creek Pass and the Slate Creek Pass. It so happens that valuable mineral deposits cluster around the headwaters of all these streams and it has so happened that every time the selection of a route has come up in the state legislature, the project has been hampered by those conflicting interests. A brief history of these struggles might be of interest. As far back as 1890, at the end of a desperate struggle, an appropriation for $20,000 was secured, providing for a road from Bellingham by way of Hannigan Hannegan and Slate Creek passes to a point in Okanogan County in Eastern Washington. The appropriation was wasted and the route declared impracticable. Ten years later the struggle was resumed with intensified bitterness, as a result of these conflicting interests. So vehement had become the contest that the legislature was on the point of throwing the whole thing out of court, as it were, when a solution was found in the last hours of the session, providing for an appropriation for $30,000 and the appointment of a commission of three to be selected by the governor, whose duty it became under the provision of the bill to examine all the routes and to select the most feasible. Commission appointed The commission appointed consisted of [Edward] M. Wilson of Whatcom, J. [Howard] Watson of Okanogan and [Richard] O. Welts of Skagit County. The advocates of the Slate Creek Pass consisted of a coterie of influential politicians, ex-Governor [Henry] McBride, Key Pitman [Pittman], now United States Senator from Nevada, and Augustus K. Moore, a lawyer of Mount Vernon. The Cascade River Pass found its backing in a mob of plain prospectors, without influence of any kind. [As] soon as the personnel of the commission became known, the advocates of the Cascade River and Thunder Creek routes gave up the struggle, feeling that the commission had been selected with a view to its partiality for the interest of the Slate Creek route. Cascade Pass via river most feasible The commission, accompanied by an engineer by the name of [Bert] Huntoon, also of Bellingham, entered upon its duties, so soon as weather conditions permitted. 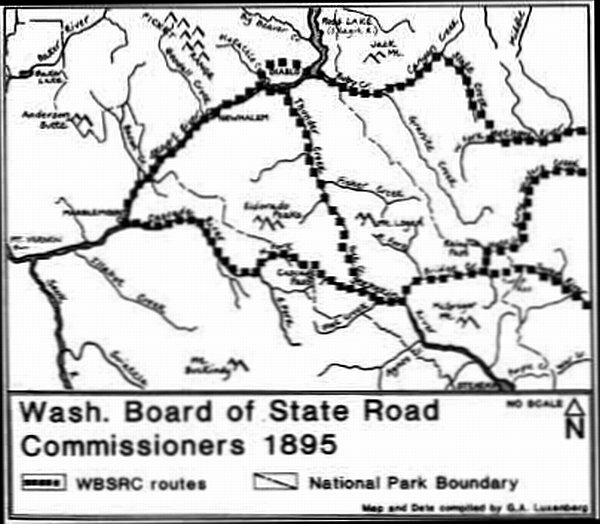 All the passes were examined, with the result that the Cascade River Route was adopted as being the most feasible and direct. In view of all the circumstances, the outcome was a surprise to everyone concerned. But, according to the commission's report, it could not, in honor, do otherwise, and so it happens that this road has ever since been and is now a duly established and going state highway. This National Parks Service map (see original) shows the Cascade River and Cascade Pass area. And see the 1893 Austin-Lyle survey map preceding the road survey. Progress of the wagon road The $30,000 appropriation was duly expended on this route. Ten miles of wagon road were opened from Marblemount eastward and a passable pack trail the rest of the way, when the money gave out. Other thousands of dollars have since been appropriated from time to time to keep the trail open to travel and the same has ever since constituted the only artery of communication between eastern and western Washington in the northern part of the state. Senator [William V.] Wells] two years ago, without consulting, generally, the wishes of his constituents, undertook to divert this road from the present location to the discredited Slate Creek route and so far succeeded that by legislative enactment he secured the incorporation of that route in the Roosevelt highway system, but failed in getting an appropriation. In the legislature about to convene, an appropriation will be asked for looking to the improvement of the Cascade River highway from Marblemount to the head of Lake Chelan, a distance of 48 miles. Fourteen miles of this distance, from Lake Chelan westward, has already been covered by a good automobile road by private enterprise and adding to this the ten miles constructed by the above named commission from Marblemount eastward, leaves only 24 miles to of pack trail to be converted into an automobile road to complete the system. The private enterprise which built the road from Lake Chelan westward has also provided a fine hotel and resort for tourists at the head of the lake and maintains, as well, a variety of water craft, including a ferry boat for the transportation of automobiles up and down the lake, a distance of 45 miles, at a nominal charge of $2.50, which charge, the management says, will be materially reduced as soon as the road is opened to through traffic and the volume of business is sufficiently large to justify. It should be impressed upon the reader that the development of the mining interests in the region traversed by this department, important as they may turn out to be, are only secondary to those of the tourist and the general public, as the road traverses a long stretch of the grandest mountain scenery upon the American continent. 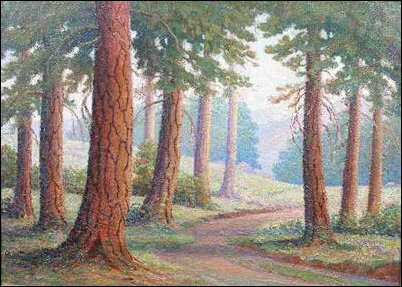 Itter exhibited this painting of Ponderose Pines in the North Cascades at the 1906 show in Seattle. This looks like a bold statement and I should hesitate making it were not corroboration convenient. For instance, in the year prior to the Columbian Exposition at Chicago in 1892, Mr. Itter, the eminent artist, conceived the novel undertaking of producing a panoramic view of the wildest and most realistic mountain scene in America, and after having scouring all the mountain ranges on the continent, chose this particular region for his observatory. The picture was duly exhibited and drew first prize, there having been others on exhibition. The picture was subsequently reproduced with striking effect in the Sunday supplements of many of the large city dailies and in Sunday magazines. The road besides passes 9oveer the very grass plot upon which Mrs. Mary Roberts Reinhart [Rinehart] sat when she wrote her inimitable description of the enchanting scene for the Saturday Evening Post. Many other eminent pens have taken a fling at it, but all in the end bemoaned their inability of doing justice to the inspiring scene. The route of the proposed Slate Creek Road leads through a comparatively speaking featureless country, while the distance from Marblemount to the village of Twisp, its eastern terminus, is around fifty miles greater than that from Marblemount to Lake Chelan over the Cascade pass. True, as the result of a compromise, the Cascade River Road was also made to terminate at Twisp, but then it is shorter by around 20 miles that the former. This diversion to Twisp occurs at the confluence of Bridge Creek and the Stehegan [Stehekin] River, 14 miles above Lake Chelan, the eastern end of the tourist road elsewhere mentioned. This branch to Twisp can, however, be eliminated from consideration at this time without sacrificing the interest of anyone, as Twisp can be reached more conveniently by way of Lake Chelan, if indeed the necessity of doing so ever arises. In connection with this matter, it may be pertinent to add that the Cascade River route is an all-Skagit County route, while the Slate Creek route is adopted, if the latter route is chosen the taxes resulting from these industries will flow into the Whatcom County treasury, otherwise they will find their way in to the Skagit County treasury. Under these circumstances it would seem that the most ordinary considerations of loyalty would impel the people of Skagit County to get behind the movement for an all-Skagit County highway over the mountains, more especially when this can be done without sacrificing the interested if the state in any way, but quite on the contrary, subserve them. It will be of interest to the people of Skagit County to know in this relation that when this Cascade Highway shall have become a fact that it will be possible for them to step into their automobiles at six in the morning, eat their luncheon at eleven at the very spot where Itter pained his panorama, take in the inspiring scene as it exists in nature, breath the rarified atmosphere of the grassy summit, mark the ponderous glaciers continually breaking from their anchorage and plugging with deafening roar into the bottomless chasms almost at their feet, and return to their homes that same evening in time to milk their cows. And further, they would feel themselves cheated if this highway were to take a route that did not afford them the opportunity of a voyage down picturesque, rock-bound Lake Chelan. It is being circulated that J.J. Donovan of Bellingham is favoring the Slate Creek route. Mr. Donovan in his capacity as civil engineer, in seeking a pass over the mountains for the proposed Bellingham and Spokane railway, explored every crack and crevice of that region, and there is perhaps not another man in the country so well informed as to existing conditions in the district under discussion. Two years ago, when this road matter came up in the legislature, this writer was appealed to for a letter setting forth the history of what had previously been done along these lines, with which request he complied. Before giving the letter currency, he submitted the same to Mr. Donovan, not for publication, bur for criticism, and in reply he received the following letter from Mr. Donovan. Your kind favor of the 19th enclosing the historical sketch of the proposed wagon road across the mountains is before me and I shall tomorrow call personally upon Mr. Sefrit, managing editor of the Reveille and the Bellingham Herald, and ask him to publish the article both of these papers. I think he will do so. We are greatly indebted to you for your clear-cut statement of the situation. I fully agree with all that you say. I personally caused surveys to be made for a railroad over the Cascade Pass in 1890 and I came through from the head of Lake Chelan to Marblemount on foot and horseback some ten years ago, and I have also been through the Skagit Canyon over the Slate Creek Pass and down through the Methow. I have also been up Bridge Creek and have caused surveys to be made in all that district so I am very familiar with it. I did everything I could two years ago to revive the project of a state road through the pass and pointed it out to the state highway engineers and also to the State Good Road Association that this was really the first state road established. We have realized that Snoqualmie would serve more people and therefore for many years allowed the Cascade road to wait. The time has now come when that road should be pushed and it does not require any tremendous amount of money to put a road through from the Skagit Valley to the head of Lake Chelan that will be passable just as many months in the year as Snoqualmie, with a little attention paid to the snow in the springtime. The letter, two columns in length, submitted by Mr. Donovan [to] this writer, subsequently appeared in both Bellingham dailies at the solicitation of Mr. Donovan. Noticing your editorial in the Daily Herald of date February 24th, on Cascade Highway, I can not restrain myself from making a few comments. The article herewith enclosed was never submitted for publication for the reason that the writer recited the substance of it in a speech before the Chamber of Commerce at Sedro-Woolley at a meeting of a large concourse or prominent citizens of Skagit and Whatcom counties, including all the members of the Legislature [from] Skagit County. Your informant as to the route and the cost of the road was evidently an enemy of the project. Under the new route as now proposed the detour over the Twisp Mountains has been eliminated. It was incorporated in the first instance to satisfy a commissioner from that district. The present proposed route continues down the Stehekin River to the head of Lake Chelan, a distance of 14 miles below Bridge Creek, with the road already built. The cost of the road from Marblemount to Lake Chelan was formerly estimated at $250,000. Under present high wages it would probably be proportionately higher. All that remains to be done is to convert 24 miles of pack trail into an automobile road. The road from Hamilton to Marblemount is as good now as the average mountain road. Except for the fact that there are three possible routes over the mountains the road would have been built thirty years ago. The town of Barron, circa 1890s, courtesy of this fine site about ghost towns, where you can order a DVD about all such towns in Washington. The Slate Creek Route was roughly the model for the mountainous route of Highway 20 once it finally opened in 1972. 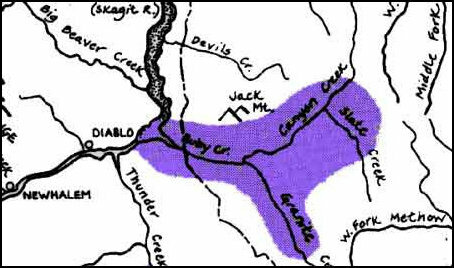 In the early 1890s, ten years after the gold excitement at Ruby Creek that Klement and John Rowley and their group of prospectors caused, placer gold discovery on Slate Creek excited people all over again, especially during the nationwide Financial Panic. Slate Creek drained into Canyon Creek, which in turn drained into Ruby Creek. A prospector named Alex Barron worked the sandbars and gravel of Slate Creek, starting in 1893 and staked his Black Jack claim. By 1895, his namesake town of Barron sprouted up with a post office, hotels, restaurants, saloons and a dance hall, and crude mills for lumber, just as Ruby City grew nearly overnight back in 1880. That was quite a feat, which you can appreciate if you have driven and then hiking up to Hart's Pass, the highest-altitude road in the state at 6,200 feet. The town was less than five miles from the old Pacific Crest Trail and roughly 50 miles from the nearest source of supplies, Guy Waring's village of Winthrop in Okanogan County. 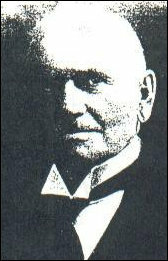 Barron had a population of more than 1,000 at its peak, financed largely by Colonel Thomas Hart bought an interest in Slate Creek mines, who built a narrow-gauge (26 inches) railroad into the mines area. One landmark, Dead Horse Point, marks the chasm where an entire string of packhorses plunged off the cliff. In 1907, the town disappeared almost as quickly as it grew. 5. Henry McBride Henry McBride was born in Farmington, Utah, on Feb. 7, 1856, and after earning degrees from Hobart College in New York and Trinity College in Connecticut, he moved to California for two years and then moved to Washington Territory in 1882. He taught school for two years at Oak Harbor, operated the telegraph office there and studied law in his spare time. He was admitted to the bar in LaConner in the spring of 1884, soon after Skagit County split off from Whatcom County. Born in Vicksburg, Mississippi, on Sept. 19, 1872, Pittman studied law at Southwestern University and was admitted to the bar in 1892. He moved to Washington state soon thereafter for unknown reasons. Pittman worked as a lawyer in Seattle and also represented clients in Skagit County in the '90s, according to George Bacon in the book, Booming and Panicking on Puget Sound (1970). After trying his luck in the Klondike Gold Rush, starting in 1897, he returned to resume his work as an attorney in Seattle in 1901 but soon moved to Nevada to follow his mining interest. When mining didn't pan out, Pittman turned to politics and thus began one of the most colorful careers in U.S. Senate history. By 1910, Nevada followed the lead of several other states and held a "mock" popular election for senator, even though Article I, section 3, of the U.S. Constitution decreed that senators would be chosen by each state's legislature. The founding fathers' theory was that this system would insure a direct connection between the states and Congress. By the early 20th century, however, the system had proven increasingly susceptible to deadlock and corruption and arguments in some states left them without one of their senators for as much as two or four years. In November 1910, Nevada voters narrowly selected the Republican Senate incumbent, George Nixon, over newcomer Democrat Pittman. Although Democrats regained control of the state legislature when it convened in January 1911, they followed the will of the voters and chose Nixon legally by the old system. Nixon died on June 5, 1912. In that same year, the U.S. Senate finally joined the House — after stalling for two decades, and agreed to a constitutional amendment allowing for the popular vote, but then the amendment required ratification by the state. Even so, the popular election for Nixon's replacement would carry special weight. On Jan. 28, 1913, Pittman won the election by just 89 votes, the third closest popular election in Senate history and the closest at that time. The Nevada legislature approved the selection as a formality on March 4, just months before the required number of states ratified the 17th Amendment. As an attorney, Pittman had specialized in mining law and much of his early career in the Senate involved promoting the interest of Nevada's silver mining industry. He also became an early backer of President Woodrow Wilson's League of Nations plan and backed Wilson's abortive effort to secure ratification of the Versailles Treaty. During those battles he began his ascendancy as an expert in foreign affairs. By the time of Franklin D. Roosevelt's presidency, he had served several years on the Foreign Relations Committee and after Roosevelt's March 1933 inauguration, he chaired the committee for seven years. He played a leading part in amending the United States neutrality legislation in order to make Lend-Lease possible with England before the U.S. entered World War II. Pittman died on Nov. 10, 1940, just five days after being reelected, thus serving in the Senate almost 27 years. His death spawned a lurid myth that has hung on tenaciously in Nevada history. By 1940 he suffered from heart disease and he had a massive heart attack shortly before Election Day, November 5. For years, stories circulated that Pittman actually died before the election and that his friends kept his body in a bathtub filled with ice at Reno's Riverside Hotel so that his Senate seat could remain Democratic. The folktale was even repeated two years later in the sensationalistic bestselling book, The Green Felt Jungle (1963) except that this time the Mizpah Hotel in Tonopah was the site of his death. 8. William V. Wells Wells was born on March 3, 1866, in Mannsville, New York. In the 1880s he moved to Jamestown, North Dakota and then graduated from Jamestown College with a law degree in 1890. He was admitted to the Jamestown Bar in December 1890 but instead of setting up a practice there, he moved to Anacortes the following February, just as the Fidalgo Island boom was showing signs of a bust. He went into partnership with George A. Joiner, who went on to be a judge. He married Daisy McLean, a Pennsylvania native, in January 1894. She gave birth to twin boys on May 20, 1897, but birth complications led to the immediate death of all three. In his grief he headed to Seattle with plans to travel and while there on July 17 that year, he witnessed the arrival of the steamship Portland from the Klondike, which carried 68 rich miners and "more than a ton of solid gold," according to the frenzied Seattle Post-Intelligencer. Wells returned to Anacortes and teamed up with Scandinavian immigrant Peter Nelson, who also wanted to head to Alaska. They booked passage on the steamship Willamette on August 3, heading for Skagway. Along with hundreds of others, they hauled their ton of supplies over the Chilkoot Pass to Dawson City and waited for the spring thaw of 1898. Wells wound up investing in claims in the Lake Bennett region and Bonanza Creek. That was the area just across the border of Yukon Territory, Canada, where Skookum Jim and company found the golden flakes in 1896 that started the rush. He stayed there until 1901, when he returned to Anacortes and resumed his practice with Joiner. This photo from a hikers website shows an old miner's cabin from June 30, 1931, and we are looking at Park Creek Pass in the background. 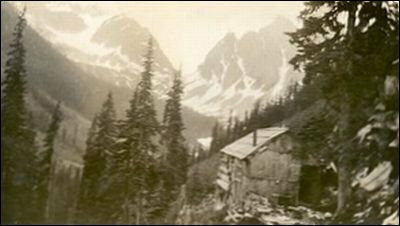 Such cabins were often left for hikers to use in the Cascades. It probably dated from the era of the 1880s through 1900. A Canadian by birth, Itter came to Seattle in 1904, and in 1905 he made an excursion to paint on and around Lake Chelan, in the medium of oil on canvas. In 1906 the Butler Hotel in Seattle hosted an exhibition of his Chelan painters, which became quite a sensation. His exhibit attracted fervent support from both the Chamber of Commerce and the Mazamas, the Portland-based mountaineers who gathered in Chelan that same year to adopt a resolution calling for a national park and perpetual game reserve in the region. This photo from the National Parks Service shows Mary Roberts Rinehart on the lead horse of a pack team near the summit of one of the mountains in the North Cascades. When the stock market crashed in 1903, the couple lost their savings and Mary began writing prolifically for magazines, selling 45 stories in her first year as an author. Four years later she published her first novel, The Circular Staircase, which sold 1.5 million copies and is recognized as the progenitor of the "Had-I-But-Known" school of mystery writing. Her 1930 novel, The Door, featured a murderous butler and inspired the cliche, "the Butler did it," even though the line never appeared in the book. Always adventurous, she accepted an assignment from the Great Northern Railroad (GNR) to join a packhorse train at Lake Chelan and write about the glories of the region. GNR had been producing promotional circulars about the lake and the North Cascades since 1902 and Rinehart had ridden on horseback through Glacier Park in northwestern Montana in 1915. Destined to become the most celebrated tour in the history of the region, it united her with two legendary figures in the early fall of 1916. Hunchbacked Dan Devore kept an extensive stable of pack horses at Merritt Field's Field Hotel at the head (north end) of the lake. Even though he was an experienced mountaineer and guide, he had only been to Cascade Pass once, in 1900, and he had never been across the Cascades divide, which has become famous as the Pacific Crest Trail. Naturalist Lawrence Denny Lindsley was assigned to photograph the trip, which would be largely improvised, with no set itinerary, except the coal of crossing the North Cascades. Known as "Silent Lawrie," he was born in 1878 in the historic house at the south end of Lake Union that was built by his grandfather, the 1851 Alki/Seattle pioneer, David Denny. At age 11, he stood on Queen Anne hill and watched the Great Seattle Fire that leveled the downtown district on June 6, 1889. Lindsley learned to hunt deer on the summit of Queen Anne in Seattle and took up photography at an early age, a skill he would develop over the years a miner, hunter, guide and student of nature. 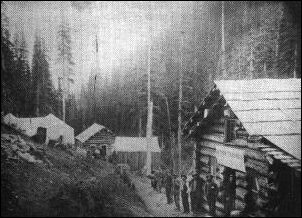 In 1895, Lindsley went to work in the Esther mine near Gold Creek in the Snoqualmie Pass area. He became a charter member of the Mountaineers Club in 1907 and his work with Asahel Curtis in 1910 led him to also to work for Edward Curtis, developing some of the "gold tones", for Edward's historically famous "Indians of North America" series. Sometime between 1910-14, he moved to land near Lake Chelan that his parents owned and GNR hired him to photograph nearby sites and Glacier National Park for the line's tourist literature. This photo from Rinehart's book, Tenting Tonight (1918), with the caption: "The Author, the Middle Boy, and the Little Boy." Most emphatically, the trip across the Cascades at Doubtful Lake and Cascade Pass is not a trip for a woman in the present condition of things, although any woman who can ride can cross Cloudy Pass and get down Agnes Creek way. But perhaps before this is published, the Chelan National Forest will have been made a National Park. It ought to be. It is superb. There is no other word for it. And it ought not to be called a forest, because it seems to have everything but trees. Rocks and rivers and glaciers — more in one county than in all Switzerland, they claim — and granite peaks and hair-raising precipices and lakes filled with ice in midsummer. But not many trees, until, at Cascade Pass, one reaches the boundaries of the Washington National Forest and begins to descend the Pacific slope. We were climbing, too. Only one thing kept us going. The narrow valley twisted, and around each cliff-face we expected the end — either death or solid ground. But not so, or, at least, not for some hours. Riding-boots peeled like a sunburnt face; stones dislodged and rolled down; the sun beat down in early September fury, and still we went on. . . . How many secrets the mountains hold! They have forgotten things we shall never know. And they are cruel, savagely cruel. What they want, they take. They reach out a thousand clutching hands. They attack with avalanche, starvation, loneliness, precipice. They lure on with green valleys and high flowering meadows where mountain-sheep move sedately, with sunlit peaks and hidden lakes, with silence for tired ears and peace for weary souls. And then — they kill. At noon that day in the Skagit Valley, we found our first civilization, a camp where a man was cutting cedar blocks for shingles. He looked absolutely astounded when our long procession drew in around his shanty. He meant only one thing to us; he meant oats. If he had oats, we were saved. If he had no oats, it meant again long hours of traveling with our hungry horses. He had a bag of oats. But he was not inclined, at first, to dispose of them, and, as a matter of fact, he did not sell them to us at all. When we finally got them from him, it was only on our promise to send back more oats. Money was of no use to him there in the wilderness; but oats meant everything. . . . The wood-cutter's wife was there. We were the one excitement in her long months of isolation. 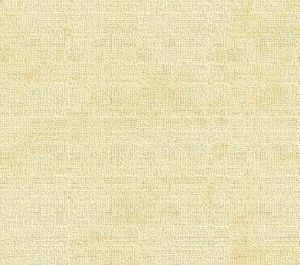 I can still see her rather pathetic face as she showed me the lace she was making, the one hundred and one ways in which she tried to fill her lonely hours. . . . We were to reach Marblemount that day and there to leave our horses. 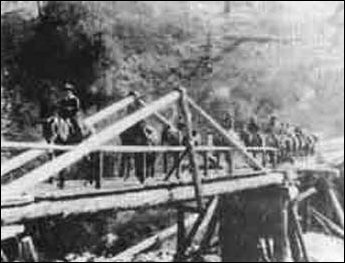 After they had rested and recovered, Dan Devore was to take them back over the range again, while we went on to civilization and a railroad. Perhaps because her writing took time away from her family, Rinehart made it up to her boys by helping them found the publishing house of Farrar & Rinehart in 1929 and when she moved to New York City in 1935, three years after Dr. Rinehart died, she became a director. Besides their own mother, the firm's high-profile authors included Upton Sinclair and Rex Stout. After Farrar left the partnership in 1946, the firm evolved into Rinehart & Company. The brothers Stanley M. Rinehart Jr. and Frederick R. Rinehart continued to operate the company until its 1960 merger with Holt, Winston to form Holt, Rinehart and Winston, now a division of Harcourt. Merritt Field's Field Hotel, circa 1911. 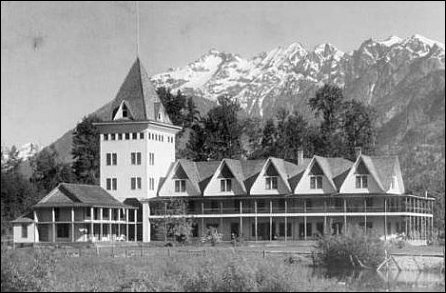 The hotel was dismantled when the lake level was raised a second time, in 1928. Back in the boom times in Washington of the early 1890s, many people looked at this particular route towards the Columbia River. But the nationwide Financial Panic soured all such dreams. One of the proponents was Frank Wilkeson, who set up a mining store with his son Bayard, 16 miles up Bridge Creek from the head of the lake. After the miners stopped coming to the store for supplies, Bayard shut the doors for good sometime in 1893 and he and his young family walked back over Cascade Pass to Frank's ranch at Hamilton Bayard's wife, Evelyn Miller Wilkeson, was the first white woman to cross the North Cascades on foot, carrying her three-year-old daughter, Mary, papoose-style, on her back. Many thanks to Buddy Meyers, who has shared details about early Lyman settlement, which supplements information provided by his parents, the late Bud and Maxine Meyers. Portal section with links to all Journal features about plans and progress, or the lack of it, over a century for the Cascade Pass Road.